Optomap Retinal Scan - Sacramento Contact Lenses & Optometry, Inc. Improved Diagnostic Abilities Without the Need for Dilating Eye Drops! In September 2003, Sacramento Contact lenses and Optometry introduced the Panoramic 200 Scanning Laser System, known as Optomap, for the screening and diagnosis of the diseases of the inside of the eye using Optomap retinal imaging technologies. 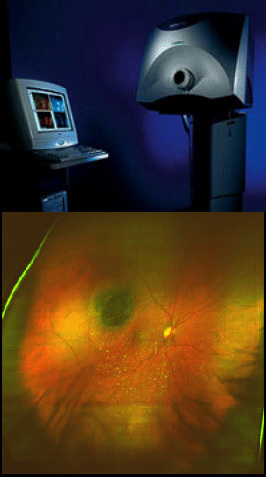 The system has been developed by Optos Corporation in Europe and provides computerized imaging of the retina, the optic nerve head and the underlying tissues. Optomap exam aids our doctors in the detection, diagnosis, and management of diseases such as macular degeneration, glaucoma, retinal tears and detachments, retinal tumors, diabetic retinopathy, and other ocular and systemic diseases. The procedure is fast, comfortable, safe, and above all is performed without dilation of the pupils! Optomap Retinal Exam allows us to view patient's retina in its entirety as well as to examine separate retinal layers, which gives us superior diagnostic capability. This retinal exam takes less than a minute, is totally painless avoids the discomfort and lasting effects of dilating drops and gives the patients the opportunity to review the images of their own retinas as the doctors examine it on the screen in the exam room. Remember, early diagnosis may save your eyesight. Ask us about the Optomap retinal exam on your next visit. Your doctors at Sacramento Contact Lenses and Optometry are always at the cutting edge of technology and have incorporated Optomap retinal imaging into our routine eye examination protocol! To make an appointment for a comprehensive eye examination including Optomap Retinal Imaging, please contact us. Optomap Retinal Imaging is FDA-approved and has been studied in terms of effectiveness at University settings worldwide. Dr. Thomas Friberg of the University of Pittsburgh Eye and Ear Institute stated following a published study of the Optomap system, "I believe due to its clinical benefits, ease of use, and patient acceptance, the Optomap retinal examination has the potential to revolutionize how eye exams are performed and become part of the standard eye examination." Ideally, every patient should have this retinal scan done as part of their eye exam, for it is the best way to find early changes in the retina, which may otherwise go undetected. And by early detection our patients can avoid potentially blinding complications. Thanks to the Optomap retinal exam we have detected such serious problems as melanomas, peripheral retinal holes and tears, sub-retinal hemorrhages, etc. in otherwise symptom-free, healthy and often young individuals.